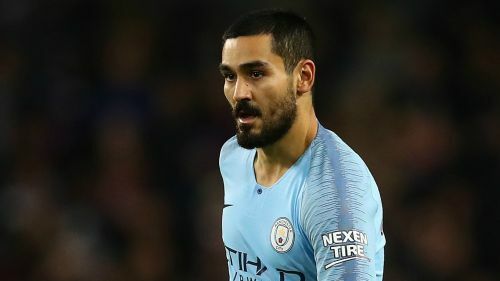 Ilkay Gundogan feels Manchester City are under "great" pressure to beat Liverpool and cut the Reds' Premier League lead. Champions City have slipped seven points behind Jurgen Klopp's side following defeats against Crystal Palace and Leicester City in successive matches, although they responded by beating Southampton last time out. With Liverpool having won nine games in a row in the Premier League, they boast a six-point advantage over second-place Tottenham in the table ahead of their trip to the Etihad Stadium on Thursday. And Gundogan accepts City need a result to boost their fading chances of retaining the Premier League title for the first time in the club's history. "Of course, the pressure is great for us," Gundogan said to Sportbuzzer. "I think it's a game on an absolute top level. It's going to be tight, as you've seen in the first leg of the 0-0 draw. "We have a chance to reduce [the gap] to four points now, and then I think the season is long enough to make up for that in the rest of the games. "It is true that in the past we often did not look so good. Now we have the chance to make up for something. Due to the situation in the table, it's a special game anyway, which we naturally want to win at home. "Regardless of how these games run out, in my view, the Premier League the best league in the world. That's why the best players want to play here, so the best coaches come here. "The level is increasing year by year. There are not only us and Liverpool, but also some other teams that are able to win the title." For Gundogan there will also be a reunion with Klopp, his former coach at Borussia Dortmund. "There is certainly, before the kick-off, a warm hug," Gundogan added. "But then you go into the tunnel already. There is a lot at stake; everyone is preparing."